Classification Filter: toggle on/off all items of a specific class, like vegetation, water, structures, etc. Materials: view elevation, flight paths during acquisition, intensity of laser pulse returns, etc. Click any “+” below to view sample data for the specific model or series you are interested in. You may also view the sample scan in your browser by click the “view scan” button in each section. Have specific sample data requirements? Contact us today. 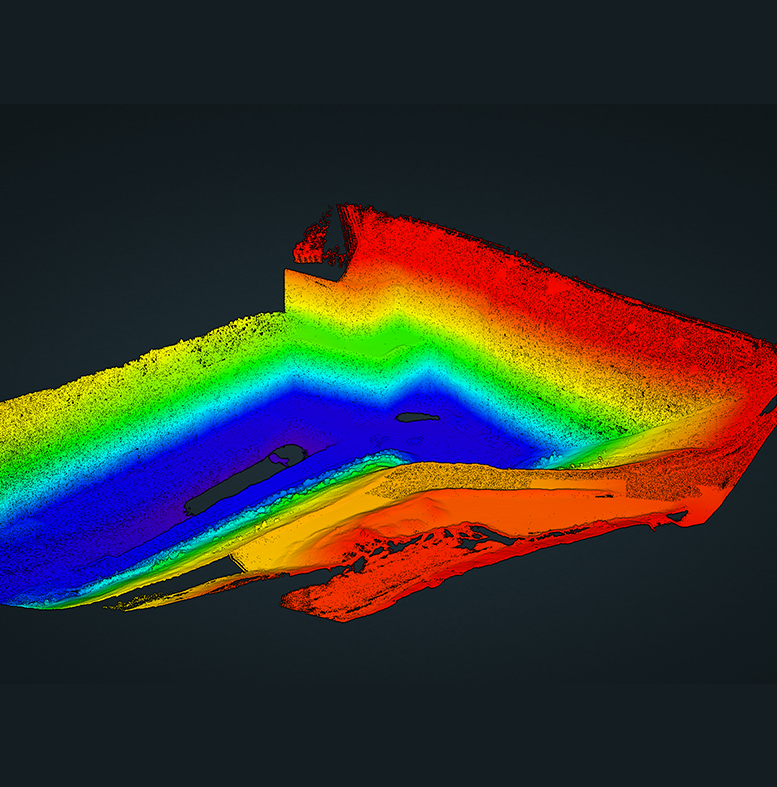 This colored point cloud features data from our entry-level Scout system with dual RGB cameras, which covered 120 degrees of swath and offered excellent oblique color. At 40 meters AGL, the Scout mapped the area with accuracy within 1 cm. This system is ideal for applications requiring oblique imagery, like open pit mining, etc. 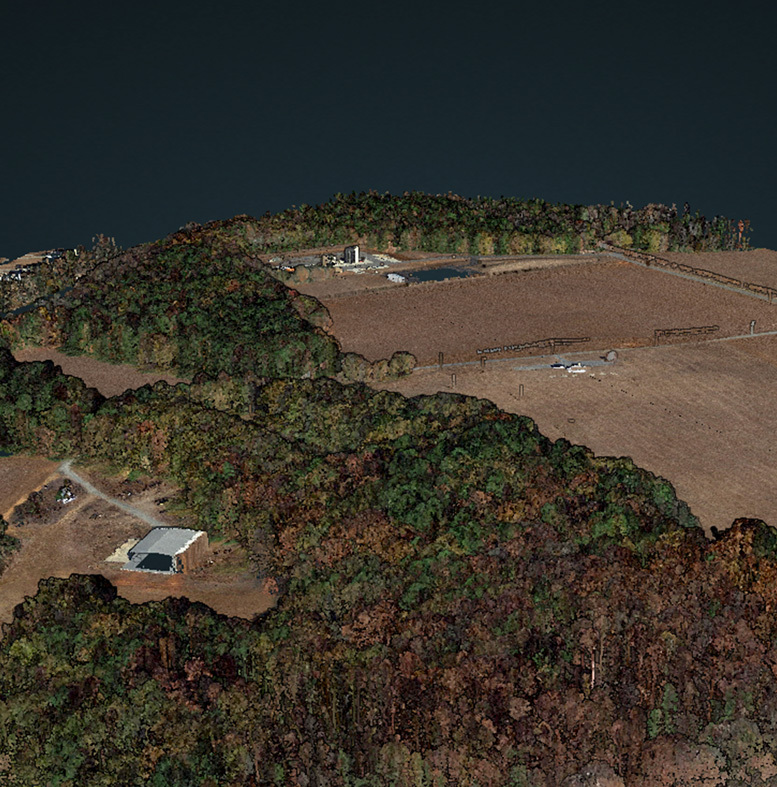 One of the most popular uses of aerial LiDAR surveying is to track and monitor power infrastructure. 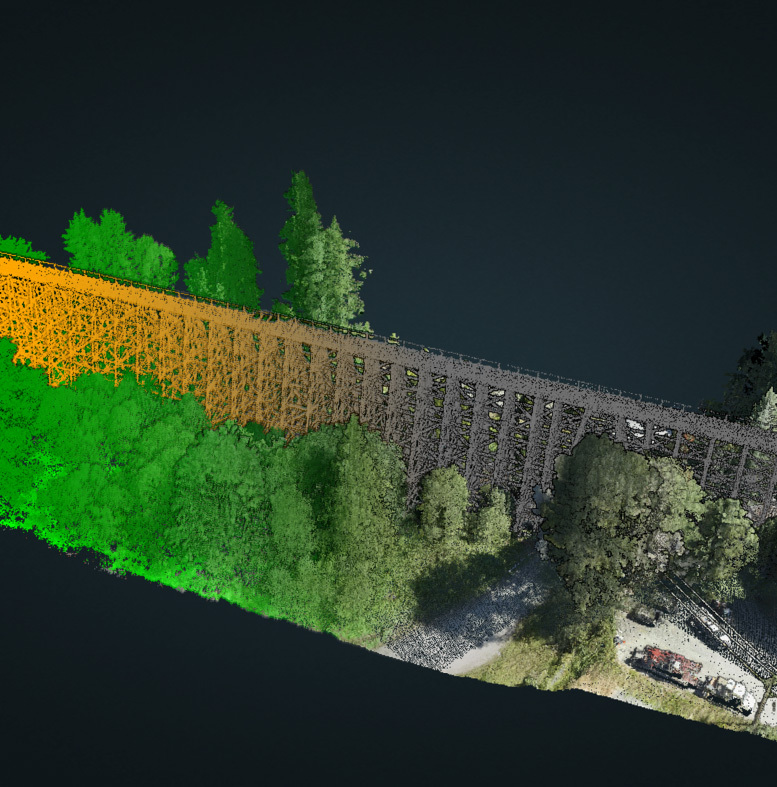 Unlike other methods, like photogrammetry, LiDAR mapping enables surveyors to detect equipment as small as power lines, even when obscured by foliage, and to perform precise measurements, like calculating line sag and hazardous vegetation growth. 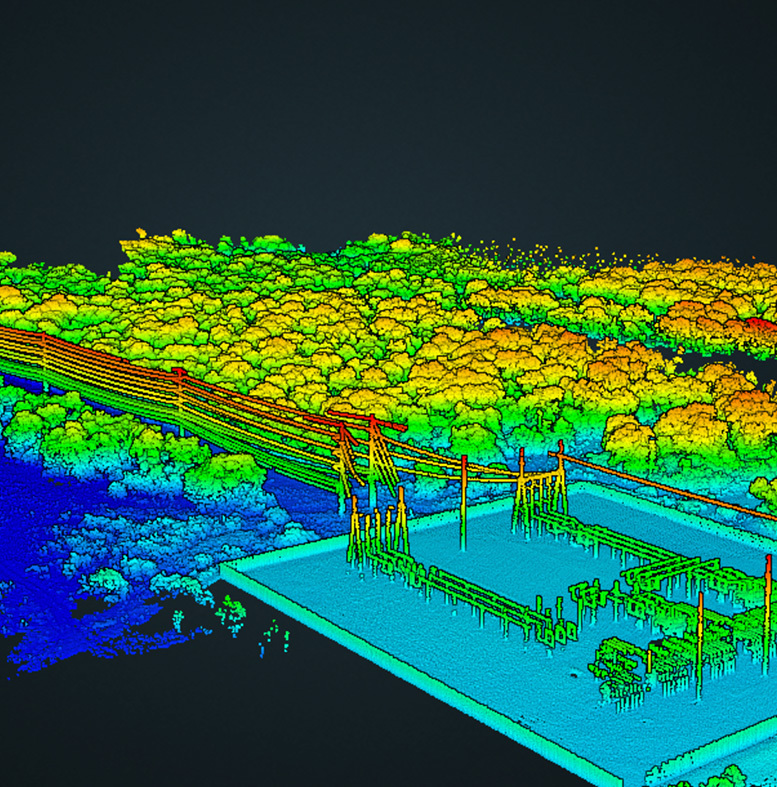 Because of its laser accuracy and the volume of laser pulses (700,000 pulses/second), LiDAR can be a cost-effective means for monitoring infrastructure, especially complex structures in remote areas with heavy vegetation, like the bridge in this scan. Mounting a Phoenix LiDAR AL3-32 system to a DJI M600 UAV system allows inspectors rare access at a fraction of the time and cost of a manned inspection. One of the strengths of UAV LiDAR is the ability to map power lines and other environmental infrastructure with laser accuracy. 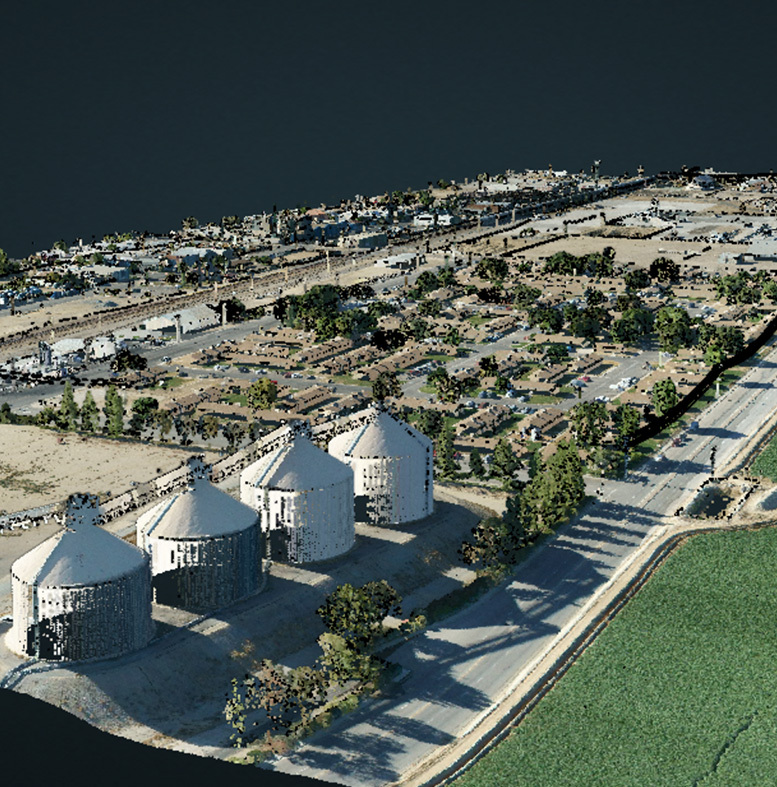 Pairing the collected LiDAR data with high-resolution photo imagery, this popular Phoenix LiDAR system produces survey-grade data that is both accurate and colorized for your application needs. 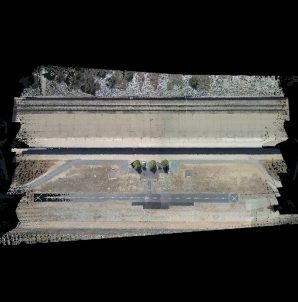 This data set was collected by a Phoenix AL3-32 drone LiDAR system with mounted DSLR HD camera, with even more data collected from the ground by using the GeoSlam Zeb-Revo handheld scanner. 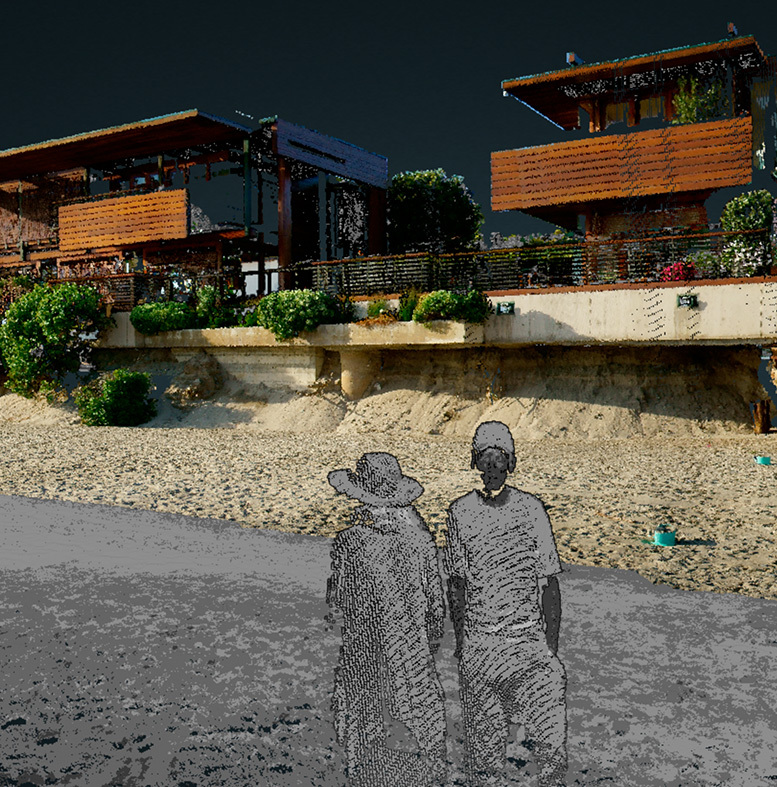 The data is combined via post-processing to produce a highly detailed point cloud. The handheld LiDAR point data is displayed in white. 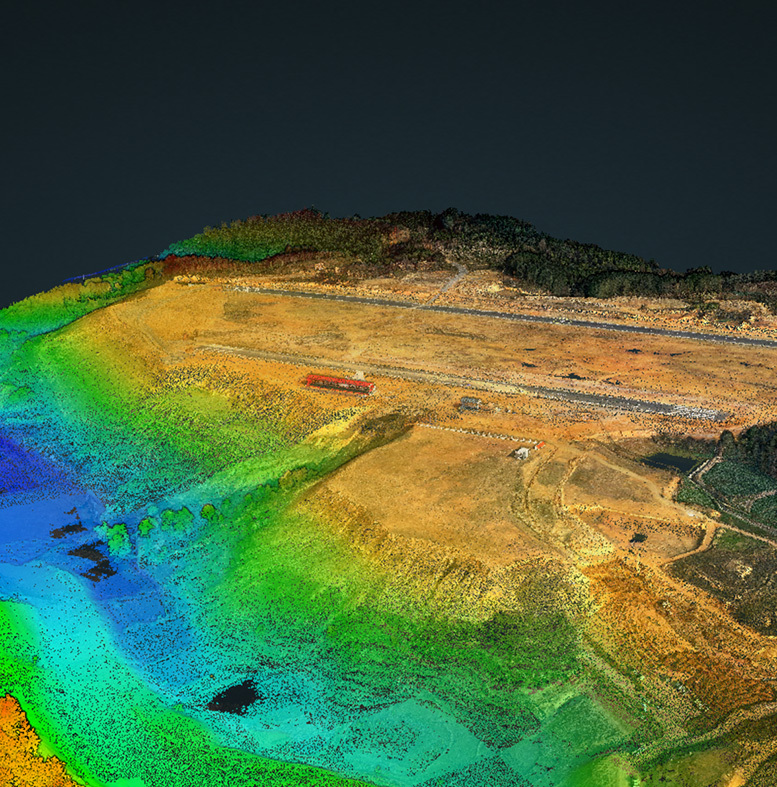 Explore an open pit mine with a Phoenix AL3-32 mounted UAV system. UVA LiDAR is a popular method of measuring volumetric data within the mining industry because of its speed and the cost savings from not having to send a manned aircraft or team teams into the rugged terrain. 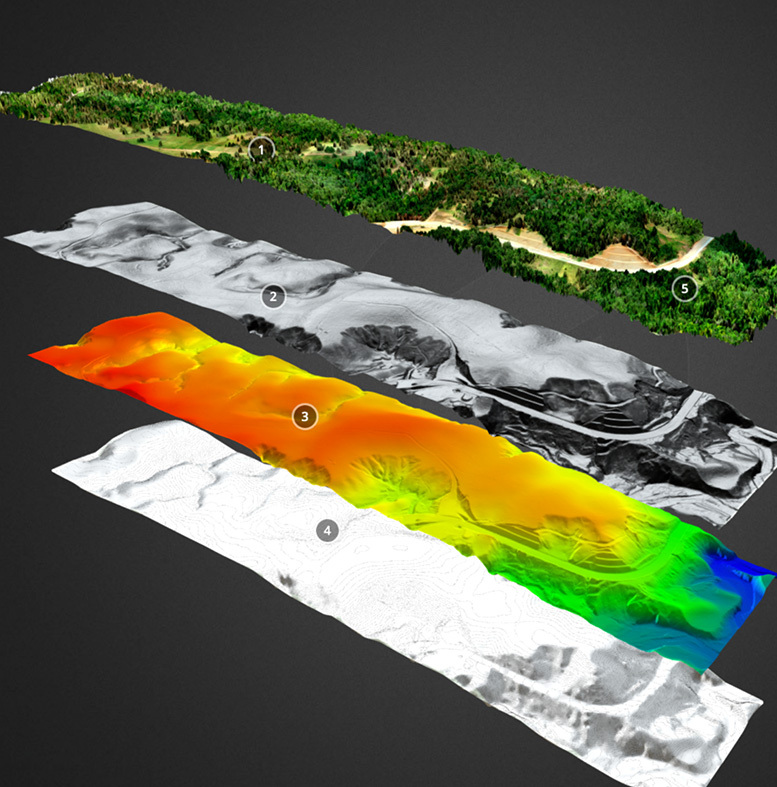 This AL3-32 combined the strengths of LiDAR with high-resolution photography, scanning a challenging landscape that included vegetation, built structures, and a sandy beach environment to produce survey-grade mapping data. 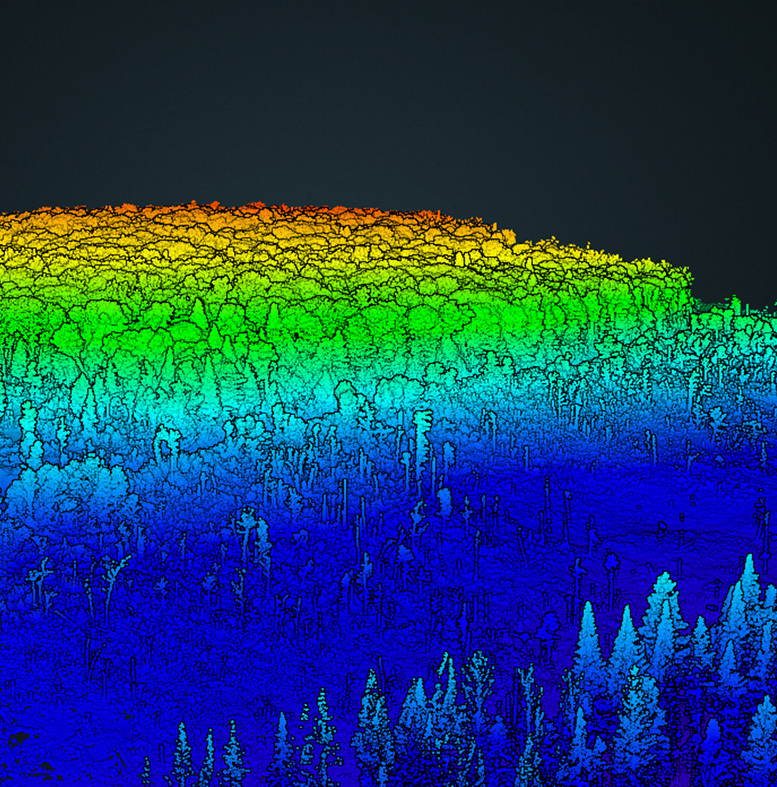 Companies in forestry often use UAV LiDAR for surveying because laser sensors can map the ground beneath vegetation and also measure the health of foliage, depending on the sensor used. 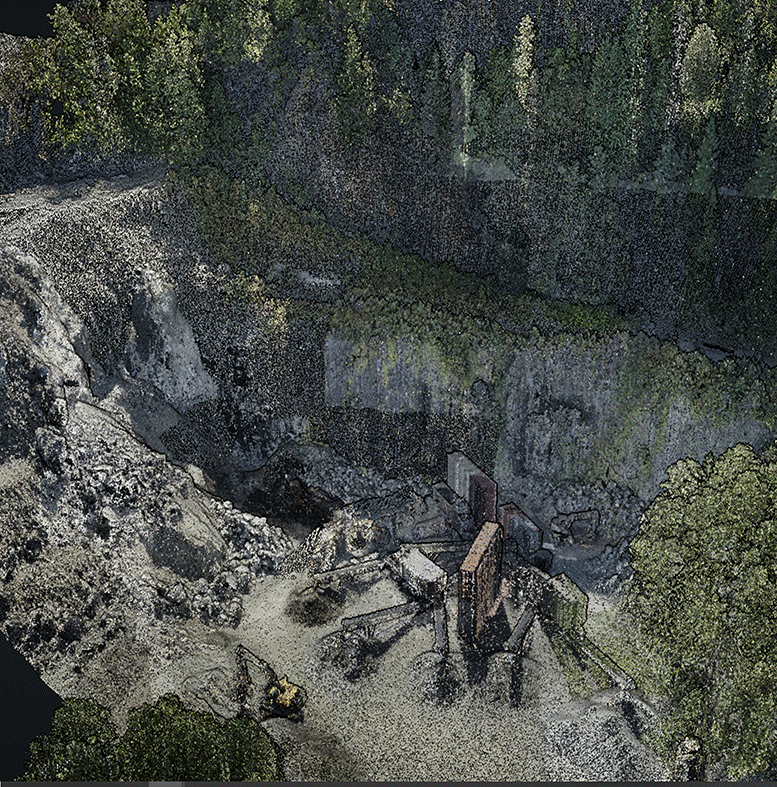 Using the AL3-32 UAV LiDAR technology, a client was able to capture fine details of this quarry. The data allows surveyors to classify the geographic land by vegetation, ground, and depth. We perform strenuous tests on every Phoenix LiDAR system. 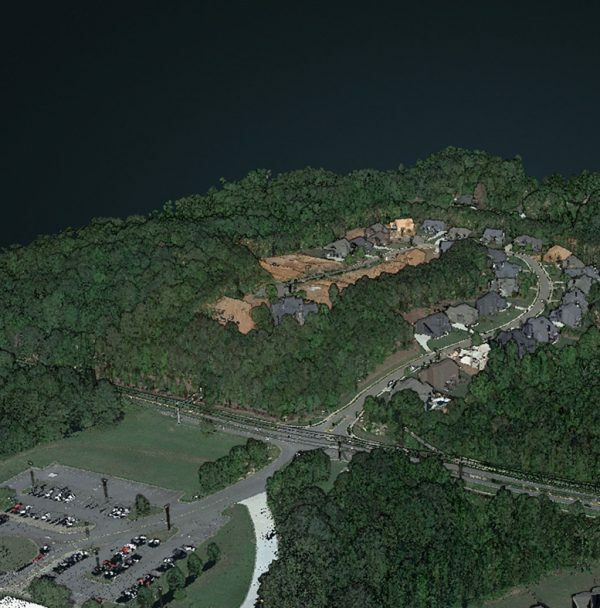 This point cloud shows data from one of our favorite testing sites, which allows us to scan various types of material, elevation, vegetation, and structures. These real-world scenarios enable our technicians to calibrate each system before delivery to clients. Part of our ongoing research and development testing new configurations. 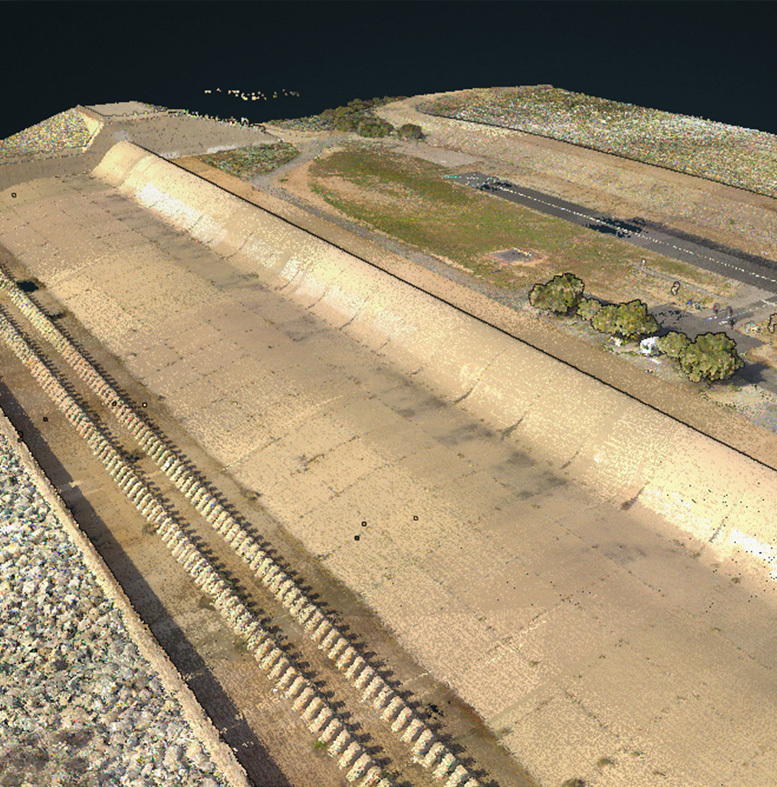 In this point cloud, our miniRANGER system collects an impressive 300 meters of RGB data in a single flight line. The LiDAR system is flying perpendicular to the concrete structure, and its integrated cameras collect a swath of color data in the center. Try using the ruler tool to measure the swath! 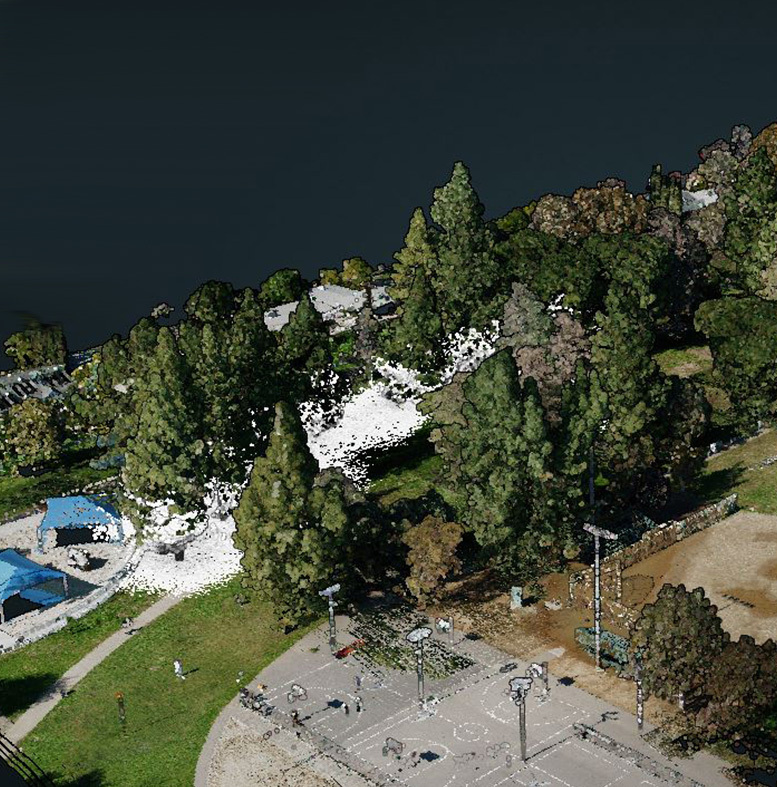 One of the strengths of the miniRANGER system is its ability to acquire precise data in densely vegetated areas, enabling surveyors to capture dense point cloud information of the ground beneath foliage that would ordinarily be an obstacle for photogrammetry systems. Combining LiDAR and an RGB camera, this system captures elevations, creeks and rivers, and human infrastructure in one mission. 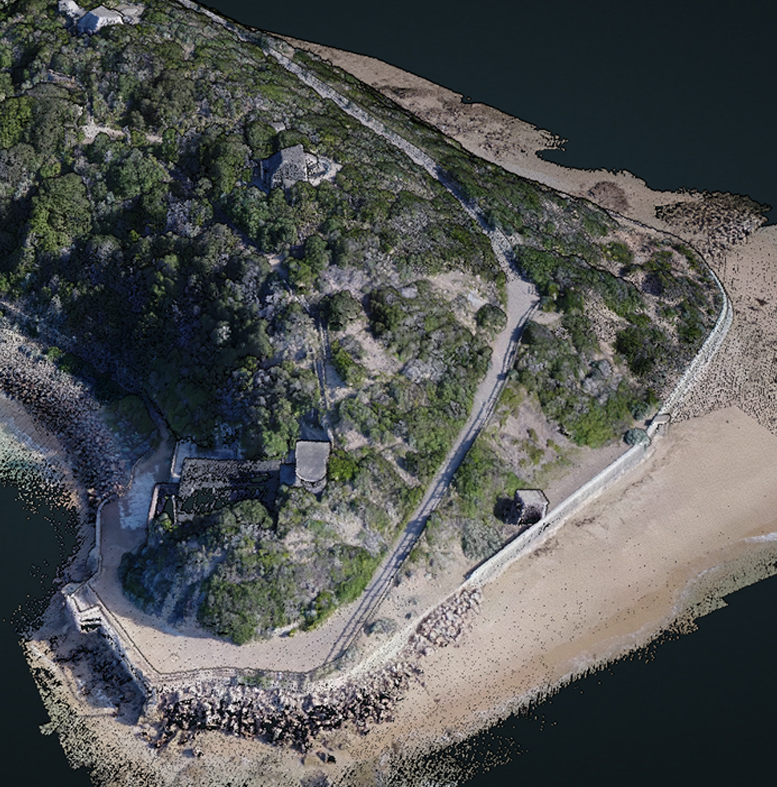 The fusion of data from our miniRANGER LiDAR system with UAV Hyperspectral imagery greatly increases the information that we can extract from a site survey. In this example, we performed a k-means unsupervised classification using the full 270 spectral band VNIR hyperspectral data cube to group vegetation types in the segmented LiDAR point cloud. 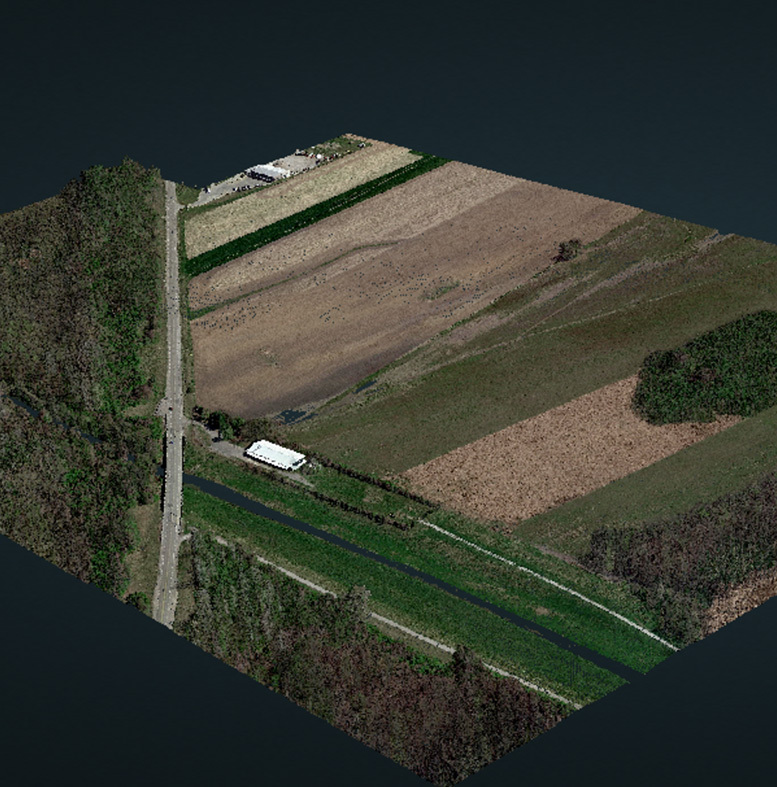 This is just scratching the surface of what can be achieve with UAV LiDAR + Hyperspectral imagery. This combination of the RANGER LR with a standard M600 UAV showcases one of Phoenix LiDAR’s most popular solutions. The ability to map power utilities has been an ongoing challenge because of the small size of power lines and frequent vegetation obstruction. Post-processing further enhances usability by introducing classifications whereby can toggle on/off vegetation, structures, etc. Many in the construction industry use LiDAR to develop and analyze surface models used for large scale project design and planning. Because of its laser accuracy, LiDAR can penetrate vegetation and map utilities from the air, saving time and increasing accuracy. When disaster strikes, utilities and municipalities must react immediately to begin recovery. Among the first tasks is to gauge the scope of damage to critical infrastructure, like roads, power lines, communications equipment, etc. 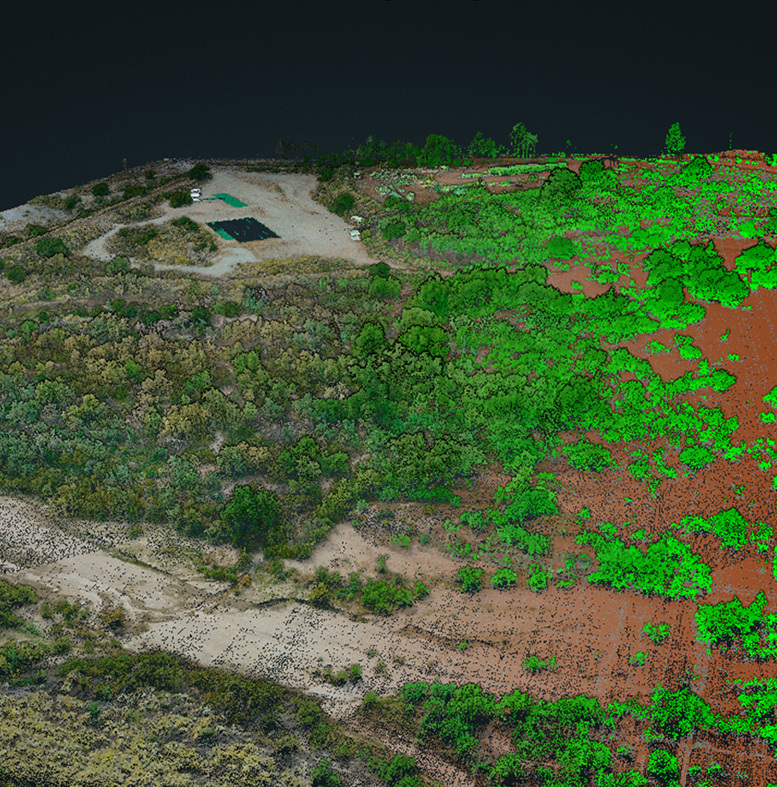 Phoenix LiDAR systems penetrate vegetation to enable responsible parties to locate power lines and other obscured equipment. Mounting a Phoenix payload on a UAV decreases the time and cost of information gathering when resources may be scarce. 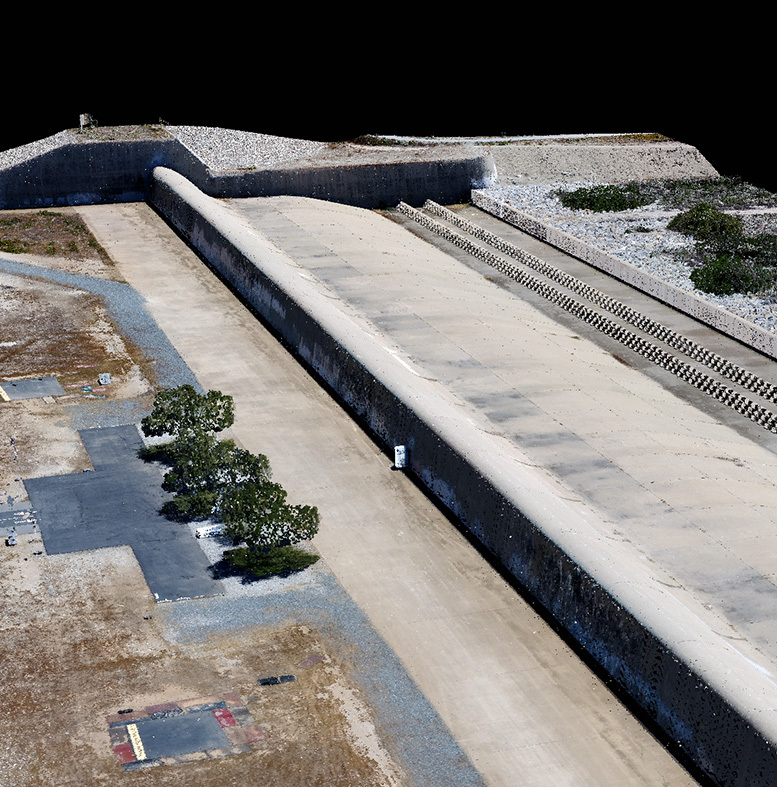 This point cloud features LiDAR data captured by the Phoenix RANGER System, mounted on a Vapor 55 single rotor UAV. The resulting high density map was colorized by satellite RGB projection onto the data for enhanced visual usability. The T-32 sensor was built for Phoenix LiDAR’s TerraHawk, the first fixed-wing, vertical takeoff and landing (VTOL) UAV LiDAR system on the market. This sensor leverages 32 lasers for high definition data acquisition at high altitudes and speeds. The TerraHawk combines the speed and distance benefits of fixed-wing aircraft with the safer take off/landing benefits of VTOL, a particular concern for surveyors in the field. The RANGER LR-T was built specifically for Phoenix LiDAR’s TerraHawk CW-30, a fixed-wing VTOL UAV. This powerful combination operates at high speeds and altitudes for hours at a time to capture some of the highest caliber LiDAR data possible on the commercial market. 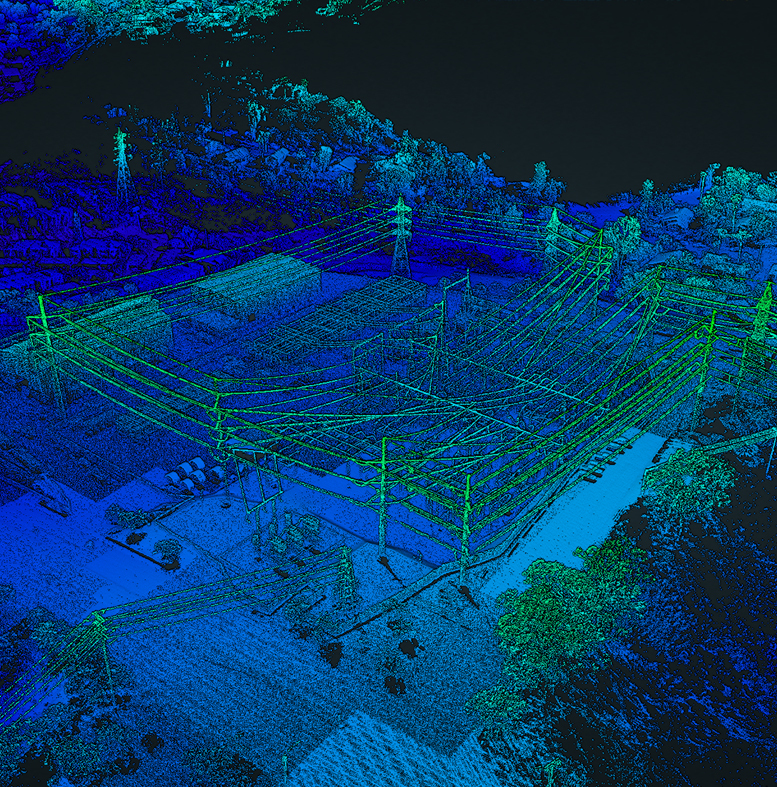 We’re proud of this data set, which features Phoenix LiDAR’s Dual RANGER system and our powerful IMU 52, producing a dense and highly accurate point cloud with sufficient detail to map utility infrastructure and power lines clearly from an altitude of 100 meters, traveling at 50 knots. As the most powerful LiDAR solution Phoenix LiDAR currently offers, this RANGER with the Long Range option, combined with an RGB camera, was mounted on a AS350 helicopter to capture high definition data of this community featuring diverse elements, like homes, concrete structures and roads, trains, farmland, and more. 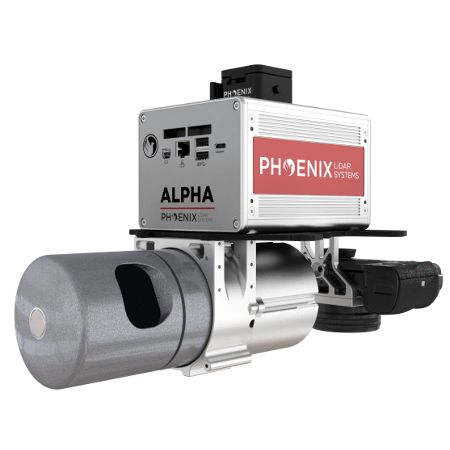 Flexibility is a cornerstone for Phoenix LiDAR research, bringing you systems that can be mounted in various configurations, from drone to vehicle to backpack. Combining this flexible AL3-32 system with an HD 360° camera on the Phoenix Roof Rack turns an ordinary car into a powerhouse of laser mapping instruments. 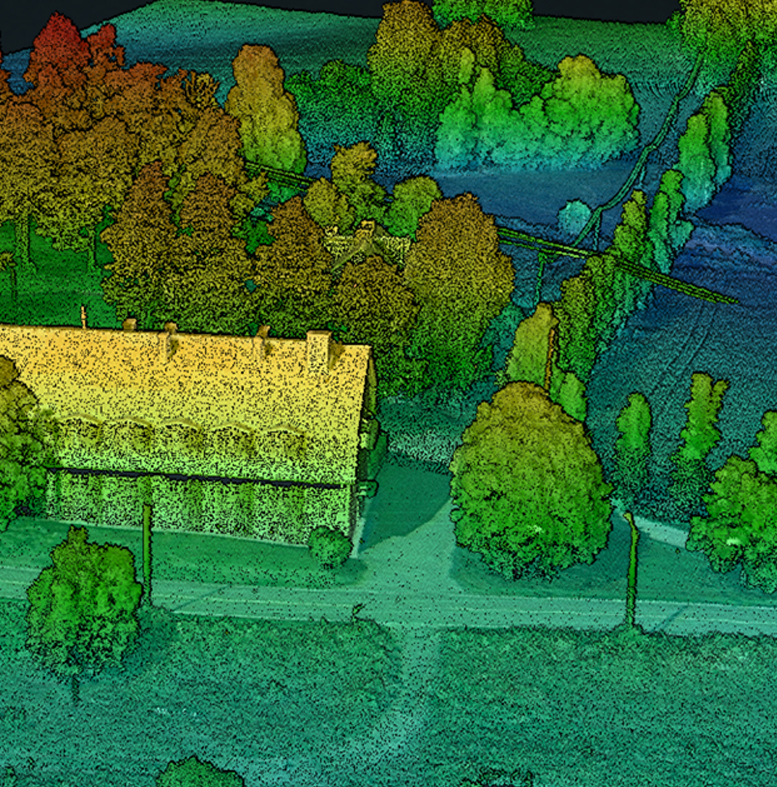 Combining Ladybug imaging data to your LiDAR scan enables 3-dimensional colorization of your models. 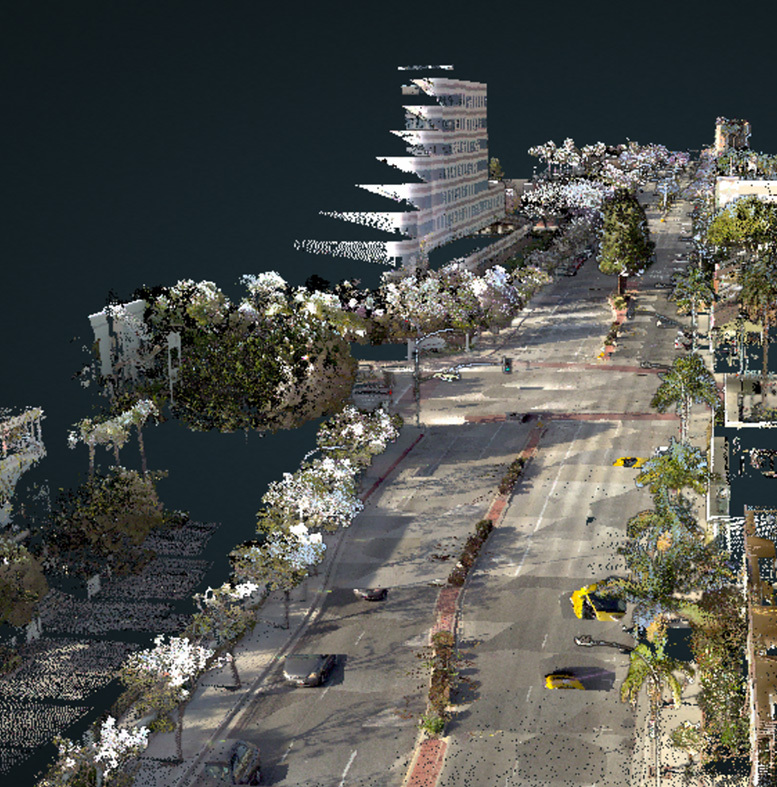 In this model, the Phoenix LiDAR system is mounted on a vehicle and driven through a city street. 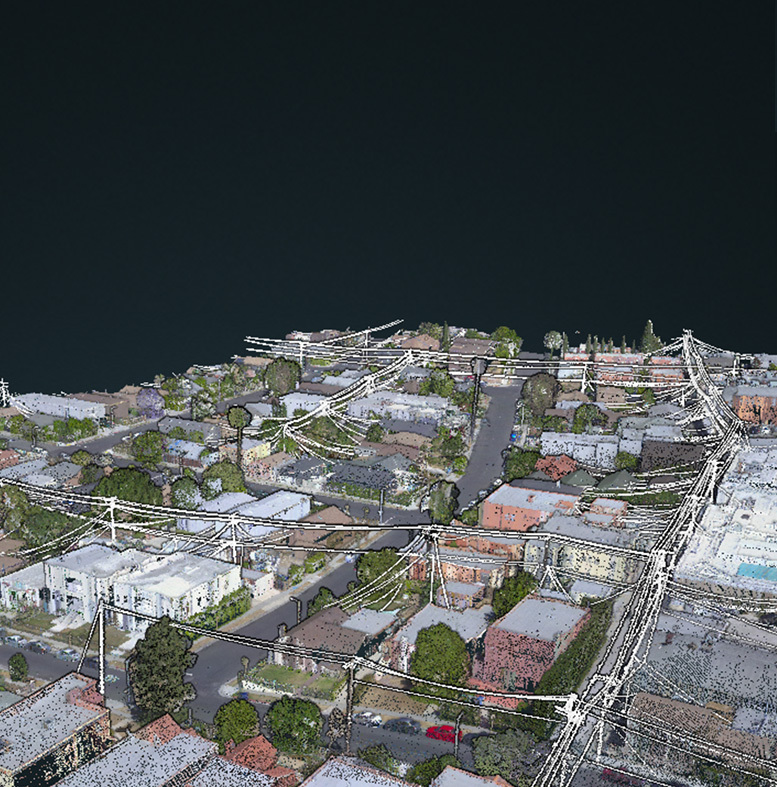 Highly detailed and beautifully colorized, this ground based scan of urban city streets combines street-level imagery with extremely high quality LiDAR coverage to provide an unparalleled representation of the urban environment. The stunning detail of the Ladybug 5+ Panoramic camera is extracted into the mobile LiDAR acquisition utilizing the Ranger LR LiDAR sensor, delivering real-life colorization while maintaining incredible accuracy. Used as a solo mapping system or in conjunction with aerial LiDAR, Phoenix’s RANGER LR system is so portable that it can be mounted onto a backpack and walked through a neighborhood to capture data. 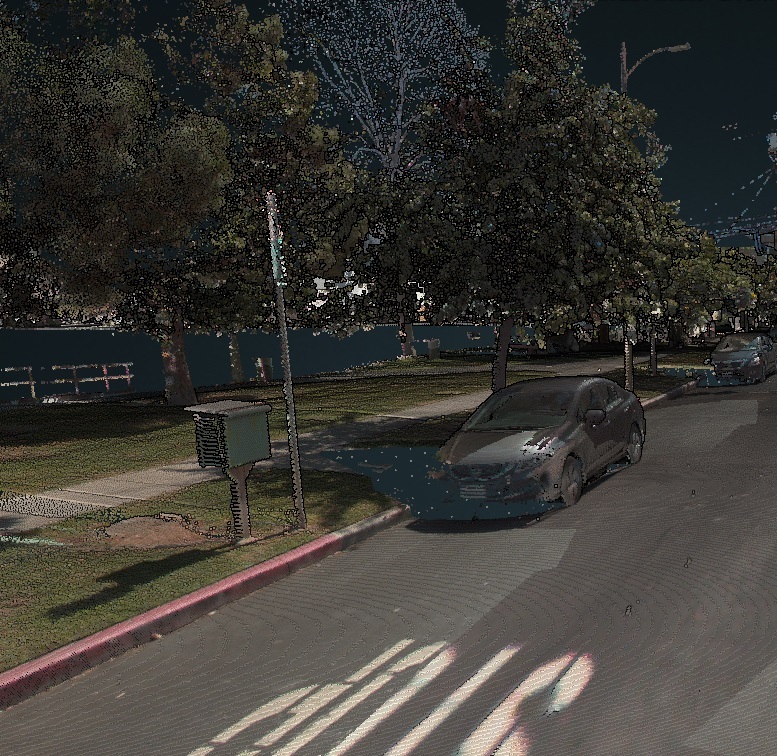 Projecting RGB color onto the LiDAR data enables a colorized point cloud for enhanced usability.